The Takeaway: Cute and cozy, with most cocktails pre-batched instead of significant bartender flair. Go for the intimate atmosphere and the service of the friendly young bartenders. 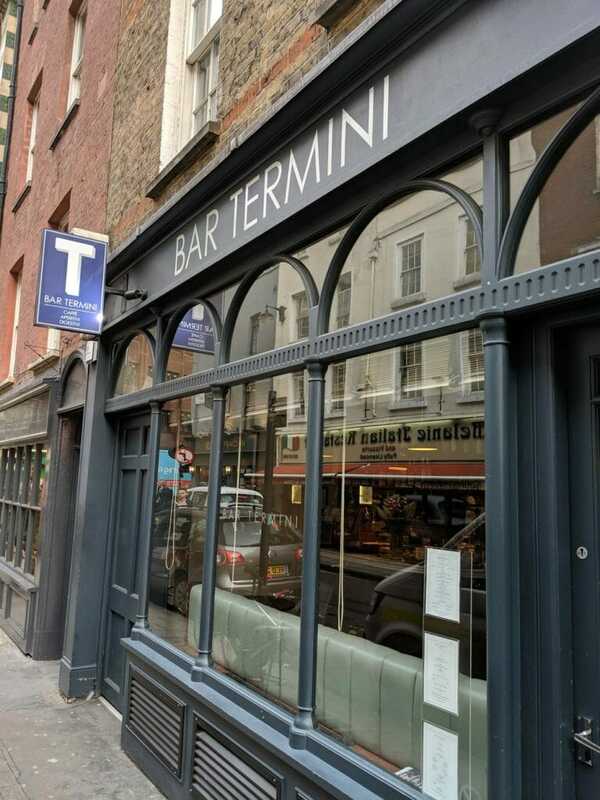 Earlier this year when we interviewed Roberta, the brand ambassador for Martini and Rosso, we had also discussed the bar that she was one of the original founding team at: Bar Termini in London. The setting harkens to the bar scene in Tokyo, featuring a small setting meant to feel intimate and private, in contrast to the detached ambiance of more cavernous cocktail destinations. 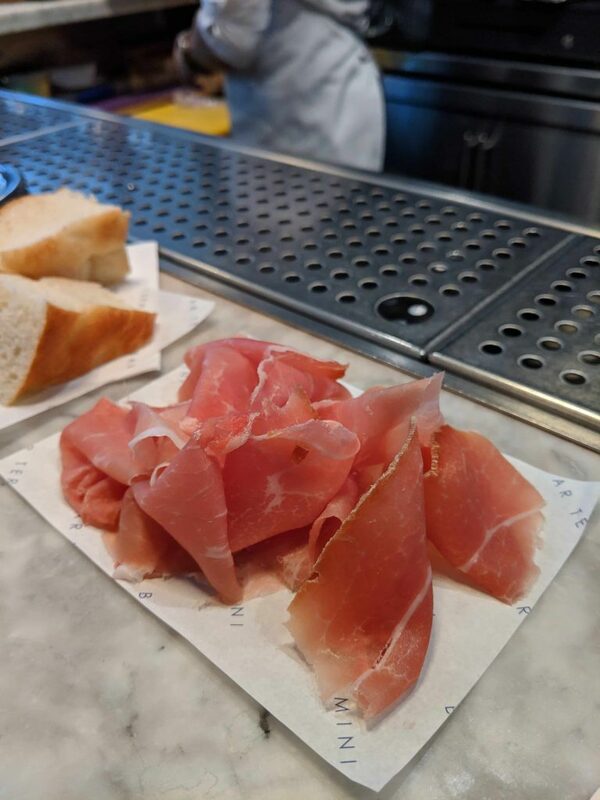 Bar Termini features only 3 seats at the bar and meant to follow an Italian approach to drinking, transitioning seamlessly from a coffee café by day to an aperitif-and-negroni destination later in the afternoon. The menu remains static – it’s simply the orders of the patrons that change. Unlike other top bars, the back bar is immensely minimalist – most bottles are of different house negroni variants with their own custom-printed labels (the posters of the prints can be ordered from Bar Termini as framed decorations), a smattering of vermouth bottles, a handful of Campari (including two vintage Campari Bitter) bottles, and hardly any hard liquor to note. Instead, the major feature behind the bar seems to be its impressively large gleaming expresso machine. 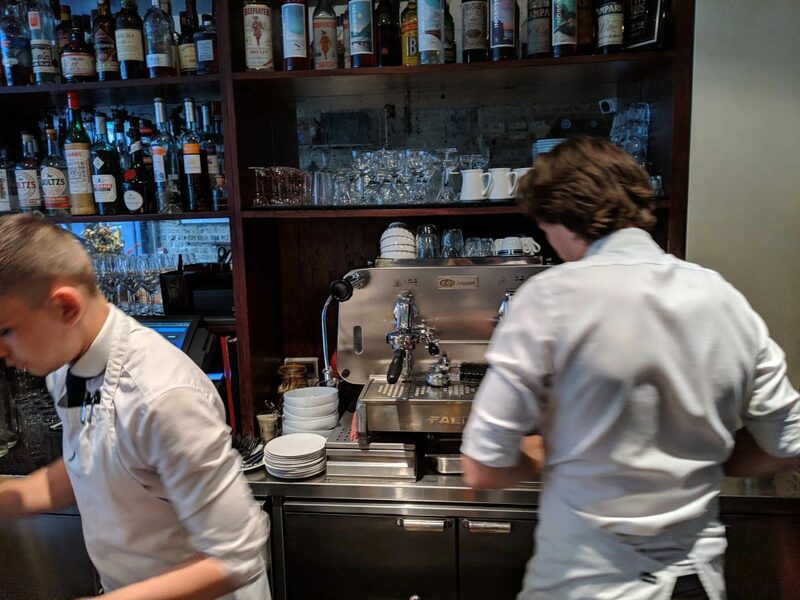 At Bar Termini, the main selling point is the ambiance, and the duo of young bartenders, one from Czech and the other from Slovakia, who jokingly referring to themselves as the “Czechoslovakia mafia” maintain a jovial atmosphere. 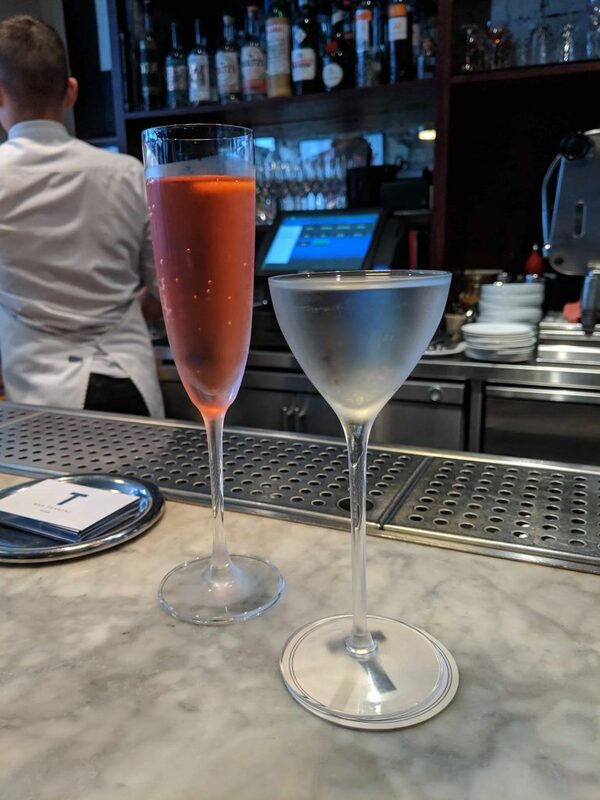 They pour out our orders (Spritz Termini – gin, cordial, and prosecco and Terroir – a bottled earthy martini-esque drink of “flint, clay, and lichen distillates”). When we order a cappuccino, they offer to chill our cocktails in the fridge so we can enjoy the cappuccino, before they realize we are barbarians capable of swigging alcohol between sips of expertly crafted cappuccino. Each new bar patron (there are only a few at the time we went, although the Czechoslovakia mafia tell us it’s less to do with the time-of-day and more to do with the natural cadence of the bar: “in 2 minutes it can be filled to the brim”) is enthusiastically welcomed, to the point we couldn’t figure out if the entrant was a regular or just merely a new face. A stoic man next to us leaves the bar, to which one of the duo sings after him “you’ll be back – you can never just have one coffee” and when he returns 10 minutes later, is met with feigned shock “I haven’t seen you in forever!”. We left feeling peppy and refreshed. It’s not a traditional craft cocktail destination by any stretch (there is nary a jigger or Boston shaker to be seen in sight), and to be honest, I wouldn’t recommend it in a short-list of must-visit bars in London, but if you can grab one of the 3 seats at the bar, I can guarantee you’ll enjoy it. As with all of our bar experiences in London, it is highly advised that you book in advance. 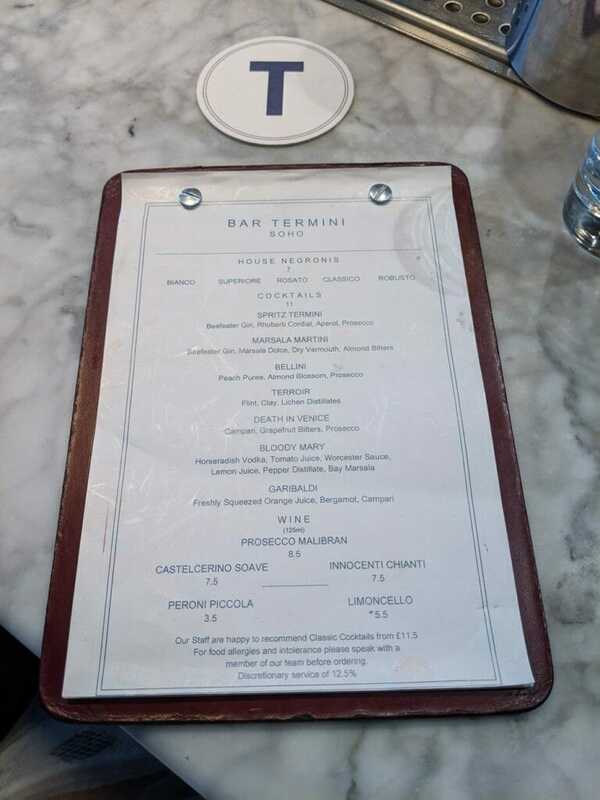 Bar termini cocktails: Spritz (left) and Terroir (right). Both excellent, but not un-expected. Bar Termini is #9 out of the World’s 50 Best Bars of 2017. For the rest of our review of the other top bars around the world, click here!